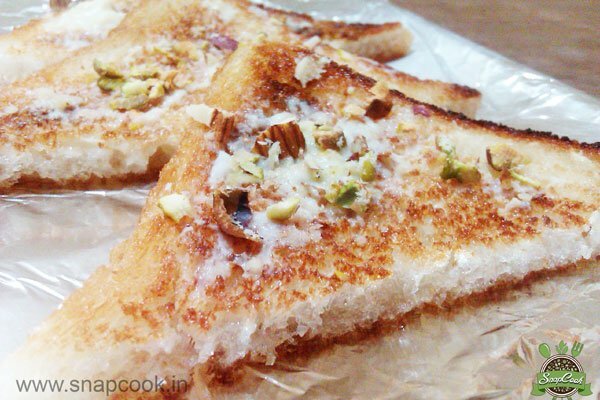 Shahi Toast as the name suggests royal dessert made of bread topping with dry fruits and rabdi. It is all time favourite dessert for all. Boil sugar and water until the sugar dissolves completely – about 7-8 minutes. Add cinnamon seeds and continue boiling until this is of ‘one-wire’ consistency. Keep sugar syrup aside to cool. Meanwhile, toast the bread slices in toaster to make it crispy and then cut diagonally. Now dip the crisp bread slices in sugar syrup for 1 minute. Remove immediately and arrange on serving plate. Top with rabdi made of milk-maid and garnish with dryfruits.